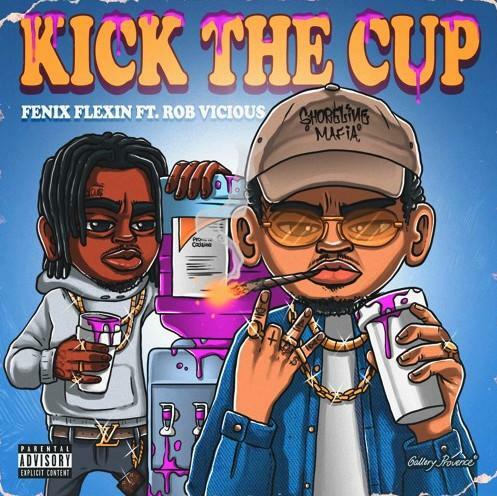 Shoreline Mafia's Fenix Flexin & Rob Vicious Team Up On "Kick The Cup"
Home>New Songs>Fenix Flexin Songs> Shoreline Mafia's Fenix Flexin & Rob Vicious Team Up On "Kick The Cup"
Fenix Flexin & Rob Vicious are having trouble trying to "Kick The Cup." It's been a few months since we've heard all the members of Shoreline Mafia together on a track but they've been putting in work as solo acts. The L.A.-based crew released their last project, OTXMas a few weeks before Christmas and they haven't dropped much music since then. Yesterday, we heard OhGeesy and Rob Vicious on 03 Greedo and DJ Mustard's latest single, "Trap House." Now, we get a new collab from Fenix Flexin and Rob Vicious. Fenix Flexin and Rob Vicious are back with an ode to syrup on their new track, "Kick The Cup." The two rappers keep the production in house with OTX Ant handling the beat. The two rappers detail their love for the muddy cocktail over L.A.-centric production. Peep their new song below. Supa Bwe & Rexx Life Raj Team Up On "Time For Me"
Yungeen Ace Confronts His Demons On "So Long"
SONGS Shoreline Mafia's Fenix Flexin & Rob Vicious Team Up On "Kick The Cup"